Another shot captured while driving, as I was out looking to get some interesting blurred shots. The PP in SEP2 Pinhole preset makes it look like a dirt road & an old car, but it isn't. My eye liked the funny tree shapes next to the power pole. Two other images captured that day & PP for the blur SC. I think those two trees are sharing a secret or something...or maybe just gossiping. Great vintage feel here. Kind of spooky to me really. Excellent! Awesome how the processing created the mood, but the basics were there to begin with. This is pretty - has an antique feel to it. Looks like a storm has come in. 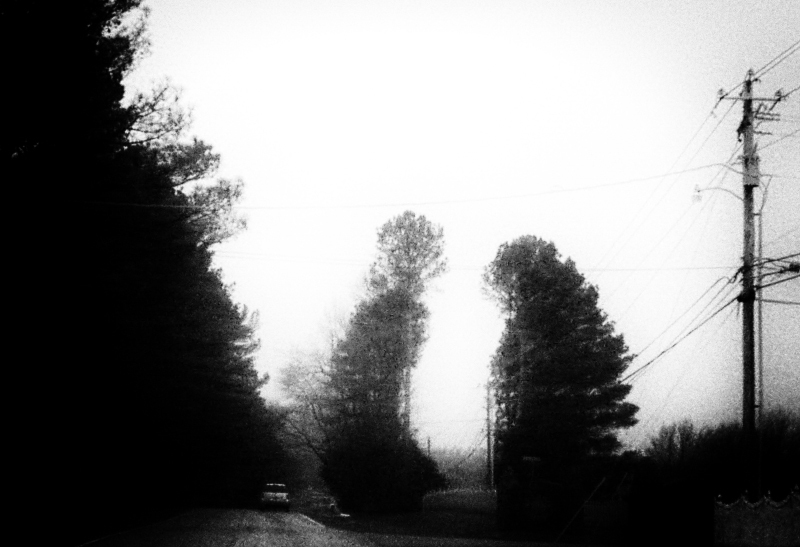 I like the shape of the two hunched over figure trees, too, but like bassbone I was taken with the car. For a different image completely, you might look at a severe vertical that loses the entire right half of the image and leaves us with just that road and barely visible car coming through low in the scene. Oh I love the SEP2 Pinhole preset. One of my favourites. It works exceptionally well on this image. Love it. Yes, the trees are really cool. I think they are doing the twist! C'mon baby, let's do the twist! Proudly hosted by Sargasso Networks. Current Server Time: 04/19/2019 12:28:16 PM EDT.